Wait, it’s November already? November? Really? It started yesterday, you say? Wow. Okay, that means it’s time for my annual embrace of the season of warmth, rebirth and cleaning everything. It’s time for a whole four and a bit weeks of daily posts plugging Stuff I Like in a cheery and upbeat fashion. It’s time for The Month of Relentless Positivity. Or, as the sad-trombone-sounding acronym goes, TMoRP! Today in TMoRP – only one day late from the outset – I want to give a huge shoutout to the good folks at The Never Never Book Box. I already mentioned this project a few weeks ago, but my first box arrived today so I wanted to reiterate my plug for this noble venture. Some of the highlights include – a physical book (The Tides Between by Elizabeth Jane Corbett), an ebook (Soulless by Jacinta Maree), a sweet gumleaf-themed notebook, an Alice In Wonderland themed magnetic bookmark, a cake mixture in a jar (also Alice-themed – the label read “Bake Me”) as well as some other lovely bits and pieces. I don’t know the work of either of the authors, but they look intriguing enough that I will certainly give them a go. The only sad thing here is that the kids watched me unbox the loot, and they’ve already claimed various bits for themselves! Well, I do want to encourage them to read and write, so I guess I can’t complain when they want the accessories as well. So here’s to a month of good reading and general positivity. Happy TMoRP, everyone! 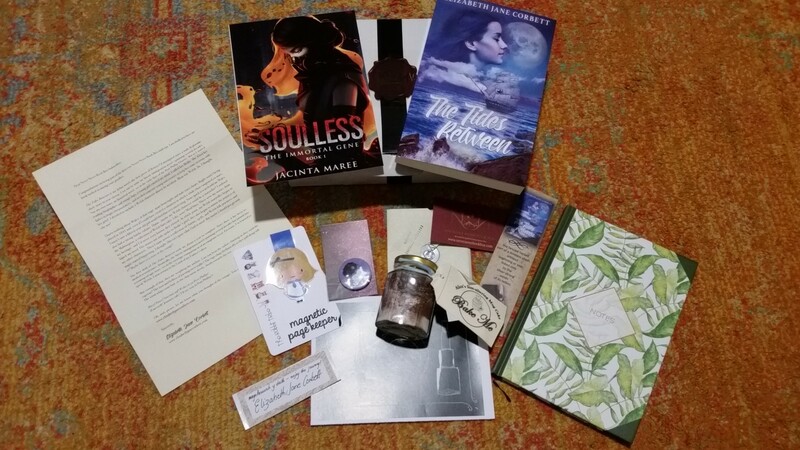 This entry was posted in Relentless positivity and tagged elizabeth jane corbett, jacinta maree, never never book box, tmorp. Bookmark the permalink.